How do we get to all autonomous cars? 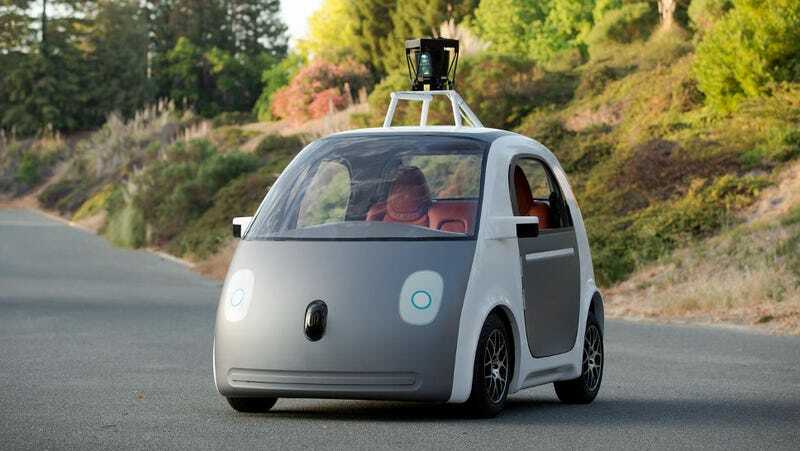 Google's prototype car that was revealed earlier this week has no steering wheel but the models they will be testing later this year will still have manual controls. But as Erik Sofge points out, to receive the full benefits of driverless cars all cars on the road will need to be autonomous. But to realize the full potential benefits of automated driving, from thousands of lives saved annually to cutting total gas consumption in the U.S. by 2 percent (or 2.9 billion gallons per year), every steering wheel must go. Robots can't draft behind each other if yet another non-autonomous jerk is muscling into their formation, or magically teleport away from the blacked-out drunk drifting across the center line. I think the mixed use period with both autonomous and manually driven vehicles will be more dangerous than either all manual or all autonomous vehicles. But the world without steering wheels is not something that can happen overnight. But whatever work has to be done, and by whom, it seems clear that full autonomy won't be as simple as blithely building a car without a steering wheel, and hoping that everyone buys one. The automotive world responds to radical technological propositions slowly, if at all. It took well over a century for electric cars to become viable products, and they still comprise a razor-thin sliver of the market's total pie. Driverless cars could follow a similar track, and crawl towards universal adoption over the next hundred years. I don't expect the driverless car revolution in my lifetime but maybe the twenty-somethings will see it. Sofge's whole post is worth the read here.